Stick Around Here Long Enough And Good Things Will Happen. The Rec Bowl is a legendary staple of Downtown Mt. Clemens, Michigan. We bring people together over bowling, burgers, BBQ, beverages, billiards, live entertainment, darts, good clean fun and more. Show up, stick around, and become part of our story. Curious about The Rec's History? Read here. LIVE Rock & Roll, Jazz, Big Band. A host to some of the areas finest events and entertainment, The Rec features one of the largest covered patio structures in Downtown Mount Clemens. For every generation, it serves as a landmark and prime destination for fundraisers, reunions, quality performances and live music. Host your next big event, see what's coming up, or just come on up to see the action. Parties, Leagues, Bumpers, Cosmic, or just good ol’ fashion bowling. 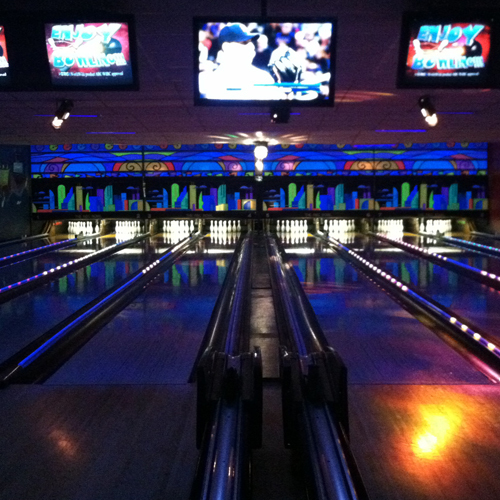 Our retro, masterfully maintained, eight lane bowling alley is ready for the good times. Come on up and get the ball rolling. The Rec Room Has Darts & Billiards Too! Please note: these are general open bowling hours. Because we host parties and flexible leagues; availability is subject to change. Please call to make sure. Turkey Club. Two slices of fresh bread, tender turkey slices, tomato and lettuce all come together. One of the many quality sandwich options. The Rec Burger. Ladies and gentlemen, it doesn't get much better than this! Oriental Salad. Grilled chicken, Mandarin oranges and fresh greens mix for a healthy and tasty plate. For more hearty and leafy choices check out our menu.